Blake Greer was born in Brisbane where he attended Mitchelton State and High Schools. It was at state school level that his painting career began. Later he drove concrete trucks and picked fruit before becoming an Architectural Artist. Blake specialises in acrylic and water colours. 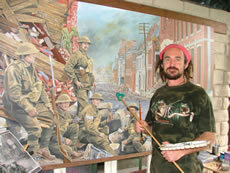 Three large paintings can be viewed in the Carriers Arms Hotel, Alice Street. These represent Maryborough history with one being the coach road to Gayndah in 1880s, the second is the Maryborough wharves and shipping in May 1880 and the third is the clipper ship 'Maulesden' near White Cliffs, Fraser Island in 1883. Another large Tomlin painting of the wharf area is located on the lower floor of the Family Heritage building, on the corner of Richmond and Wharf Streets. 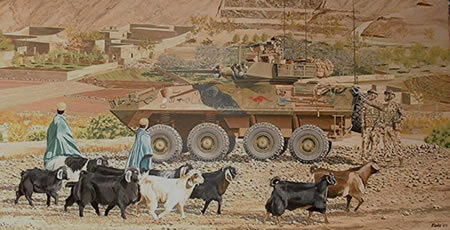 A painting, inspired by Mary Poppins stories, is located in the Visitor Information Centre in the City Hall. Trench Art includes painted or decorated artillery shells, crucifixes, jewellery and talismans, carvings and models created from discarded metal by soldiers and prisoners of war. This activity helped to fight boredom while soldiers waited in the trenches. 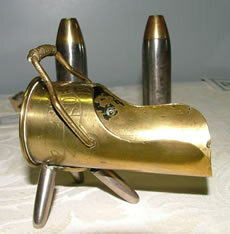 Numerous pieces of trench art can be viewed throughout the museum displays.